It’s a busy Saturday night in the National Hockey League with 11 games on tap, even after a pair of matinees were played earlier in the day. After going 2-0 with a push on Thursday, we lost our only bet last night on the Blue Jackets first period moneyline. We liked Columbus to come out with some extra energy early after getting reamed by Tortorella, but the Jackets continued their lackluster play of late in trailing 1-0 after one period en route to a 3-1 loss to the Sharks. The Blue Jackets might have been the league’s best feel-good story last year, but the wheels look like they’re coming off in Columbus lately. They’ve posted just 2 regulation time wins in their last 15 games, mostly due to an offence that keeps firing blanks. Over their last 10 games, the Jackets have scored only 16 regulation-time goals. Yet, the total on their game tonight is set at 6 because their hosts, the Islanders, score and give up goals as if they are bodily functions. But with the way the Jackets are slumping offensively (New York’s attack has been sputtering a bit lately as well), we think that total is a bit too high, so the Under 6 in Brooklyn is one of 5 plays we’ve got tonight. You can see our other 4 bets tonight below, along with breakdowns and opinions on the rest of the games. Good luck tonight! Reasons to bet Colorado: The Avalanche is 11-2-1 in its last 14 games, including a 4-3 OT win Thursday in Edmonton. Winnipeg could be without 2 of its top defensemen in Myers and Trouba. Reasons to bet Winnipeg: The Jets are 18-3-2 at home this season and are 5-1-3 in the last 9 meetings. Colorado has won just 2 of its last 9 trips to Winnipeg and remains without leading scorer MacKinnon. Reasons to bet Columbus: The Blue Jackets have won 5 of the last 6 meetings, including a pair of victories already this season in Columbus. New York has lost 5 of 7, scoring 2 goals or less in 6 of those 7 outings. Reasons to bet New York: The Islanders are 13-8-3 at home. Columbus has scored just 16 regulation time goals in its last 10 games and is playing for the second straight night. Reasons to bet New York: The Rangers have won 3 straight meetings and 5 of the last 6. New York has won 20 of its last 26 following a loss of 3+ goals like Thursday’s 4-0 stinker at home against Toronto. Reasons to bet Nashville: The Predators are rolling, collecting points in 9 of their last 10 games (7-1-2). New York has allowed 4+ goals in 6 of its last 9 games. Reasons to bet Minnesota: The Wild is 6-1-2 in its last 9 games, allowing 2 regulation time goals or less in 8 of those 9. Dallas has lost 4 straight meetings and 7 of the last 10. Reasons to bet Dallas: The Stars are 17-8-1 at home and have held 4 of their last 6 opponents to 1 regulation time goal. Minnesota has allowed 3+ goals in 13 of its last 16 road games. Reasons to bet Tampa: The Lightning has won 4 of its last 5 games and is 18-8-2 on the road. Vancouver has won just 10 of its last 38 home games dating back to last season. Reasons to bet Vancouver: The Canucks have won 3 of their last 4 games and 5 of 8. Tampa has been outshot in 7 straight games, including by 43 shots in its last 3. Reasons to bet St. Louis: The Blues have owned the Sabres for more than a decade, winning 20 of the last 23 meetings and 10 of their last 12 visits to Buffalo. The Sabres are 6-14-3 at home. Reasons to bet Buffalo: The Sabres have allowed just 7 non-empty net goals in their last 5 games. St. Louis has lost 7 of 10 on the road. Reasons to bet Detroit: The Red Wings are 3-1-1 in their last 5 games, allowing 2 regulation time goals or less in 4 of those 5 outings. Detroit has won 3 straight on the road. Reasons to bet Florida: The Panthers have won both of their games following the all-star break and have won 5 of 7 at home. Detroit is playing for the second straight night and 3rd in 4. 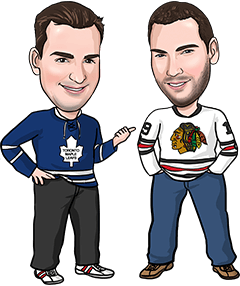 Reasons to bet Toronto: The Leafs have recorded back-to-back shutouts and have held 6 of their last 8 opponents to 2 regulation time goals or less. Boston has lost the last 6 meetings. Reasons to bet Boston: The Bruins have earned points in 19 of their last 20 games overall and are 17-6-4 at home. Toronto is playing its 3rd game in 4 days. Reasons to bet Pittsburgh: The Penguins have scored 18 goals in their last 3 games and have won 4 straight and 8 of 10. New Jersey has allowed at least 3 goals in 6 of its last 7 games and 8 of 10. Reasons to bet New Jersey: The Devils are 14-8-3 at home. Pittsburgh has lost 15 of its last 21 games in New Jersey and is playing for the second straight night. Reasons to bet Chicago: The Blackhawks have earned points in 10 straight meetings with Calgary, going 6-0-4. The Flames have lost 6 straight and are just 12-13-3 at home. Reasons to bet Calgary: The Flames should bring lots of urgency here in their final home game before a 6-game road trip. Chicago has allowed 15 goals in its last 3 games and has lost 5 of 7. Reasons to bet Arizona: The Coyotes have won their last 5 visits to Los Angeles. The Kings have dropped 8 of their last 11 and are playing their first home game since Jan. 21. Reasons to bet Los Angeles: The Kings should be desperate to get back on track, especially after a humiliating 5-0 loss Thursday in Nashville when LA was outshot 36-19. Arizona has been limited to 2 regulation time goals or less in 5 of its last 6 games and 8 of 10.